The terms ‘Village Fete’ and ‘Brick Lane’ are not the sort of terms that get used interchangeably, yet on Sunday 27th July 2014 Brick Lane will be hosting just that, albeit probably without the maypole. Part of a double header of charitable events the fete will join the Brick Lane Art Auction on Thursday 24th July with the ultimate aim of raising money for Ability Bow, a gym catering for people with disabilities in East London. Inspired by Chris McMuck, a manager and promoter in the music and clubbing industry during the early 90’s, he was diagnosed with Primary Progressive Multiple Sclerosis in 2005. After this industry friends teamed up to create what became known as the Brick Lane Village Fair and Auction. For the auction a whole host of artistic talent have donated artworks. 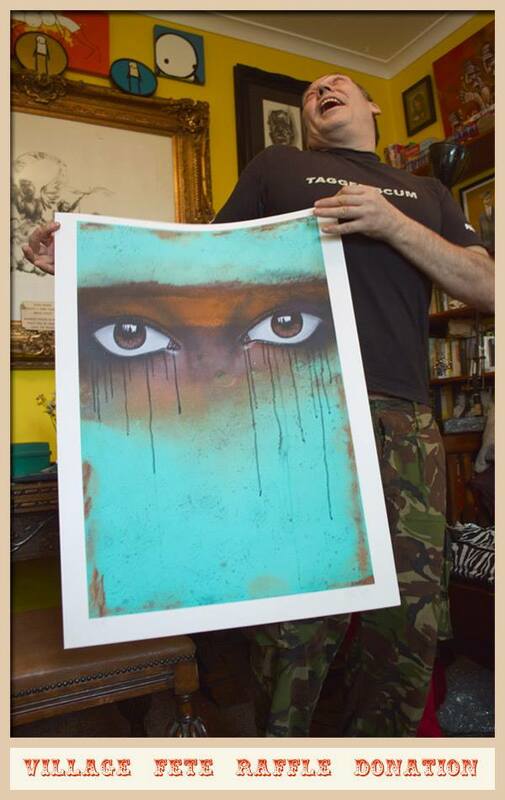 The likes of Mydogsighs, Anna Laurini, Benjamin Murphy. AK47, Andrew Weatherall and even Vivienne Westwood will be on show at the Beach Blanket Babylon on Brick Lane. Whilst the fete will take place in the grounds of St. Matthews Church in Bethnal Green, admittedly not exactly on Brick Lane itself, but what the heck, it’s close enough! Curating the auction side of things will be Andy Link, otherwise known as artist AK47. Claiming to be not normally one given to charitable causes, “I’ve seen the effects that this disease can have” he tells me. The experiences of his friend Chris spurring him into action. A contemporary of Banksy, Andy has been around the East End art scene since the late eighties and those contacts built up over years have helped him amass a huge knowledge of the urban art scene. That knowledge will be put to good use as the auction aims to raise money for Ability Bow, the gym which helps people with long term disabilities and health conditions. According to AK47 there will be a mixture of established and up and coming artists on show and judging by some of the pieces available already he has already assembled an impressive gallery of work.